Ready for this life changer? If it tastes like the scummiest thing you've ever put in your mouth, it's infected. If it makes you vomit, it's infected. If it smells like someone set off a sulfur bomb, it's infected. If you open the cap and the beer explodes like it has been shaken up a thousand times, it's probably infected. This happens as rogue yeast or bacteria has over carbonated your beer, resulting in too much pressure building. Such an explosion should not be confused with a beer bomb caused by the addition of too much sugar when you primed the beer. Basically, a good rule of thumb is that if you really have to ask if your beer is infected, then the chances are it probably is. You can, of course, do a visual inspection of your beer before you bottle it as well. 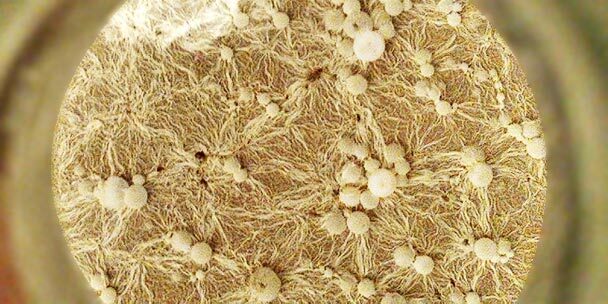 What you are looking for at the top of the wort is the formation of 'pellicle' - which is a collection of microbes hanging out on top of your beer. This may not happen with every infection, however. Which is a real shame because it's not just the fact that your beer is ruined by bacteria or wild yeast commonly referred to as brettanomyces, it's that you've lost your time - it doesn't matter if you've used a kit or done a diligent boil, you have lost those precious minutes. You've also lost a bit of cash, which can hurt a little, especially if you've gone and sourced that special wheat yeast from the brew shop or those homegrown hops that you drove 45 minutes to get from a brewing mate who swears they are the best he's ever grown. So what did you get out of this? I learned from my screw up and have never had an infected batch of beer again and that was like three years ago. Sure, it can be a pain to do the job right but if you want to have a beer that's right to drink, you gotta clean. So let's talk about the causes of infection. The most likely cause is as you've probably understood if you've got this far is that uncleanliness leads to infection. By giving bacteria something to feed on or hide in, you open yourself up to a higher chance of infection occurring. So, clean your fermenter, brewing spoons, pipes, spigots, taps, mash tuns and whatever else you use on brewing day. There's many kinds of cleaning agents you can use (such as the famous Powdered Brewery Wash) but a bit of elbow grease with damn hot to boiling water will do you justice. Then, sanitization is key. We have promoted sodium percarbonate many times on this site as we think it just does wonders and since we have adopted it, we've never had a problem. So on brewing - clean and sanitizing everything. Don't be lazy or your beer will be hazy! The next time you'll want to think about bacteria is bottling or kegging day. Yep, it's almost a case of literally rinsing and repeating. Your keg and bottles must be free of any gunk and residue yeast. Given them a damn good clean and then use your sanitizer of choice. In the case of bottles, my favourite trick is to run them through the dishwasher on the heaviest setting. First I rinse them with water to remove all the sediment etc and then they go in. At the Heavy Duty setting, the dishwasher will use the hottest water it can and that kills the bugs. I then store them in a clean drum under a blanket. Then on bottling day, a quick soak in some sodium percarbonate solution makes things just right. You can always tell if you haven't done this part properly because if in your whole batch of bottled beers one or two do not taste right but the rest do, you can reasonably assume the issue was with the individual bottle and not the batch as a whole. We mentioned that rotten eggs can be a sign of an infected beer. That may well be true but it is not true in every case. If you have used a yeast strain that produces this kind of smell your beer is OK. If you open a bottle conditioned beer too early, you might be able to get those eggy tones. If you let your beer condition for long enough, that smell will go away as the yeast will have continued to work everything out. If however, your beer has bacteria that has contaminated your beer, THAT smell is a sign your beer is ruined. How can you tell? Do the taste test and that will give you a big indicator. If you are making wine or cider, there is another risk vector for your brew. That is the natural yeasts that can be found in fruit that can wreak havoc. Many cider makers will use campden tablets to kill off any wild yeast and then substitute their own yeast more suited to the kind of wine or cider that they wish to make.